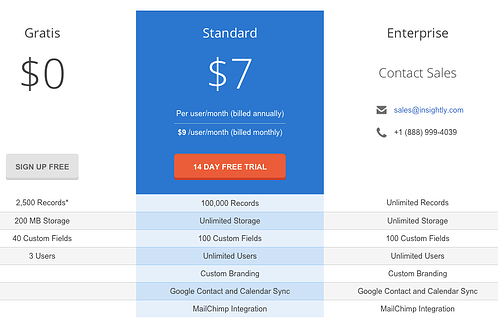 As a whole, we’re really bad at pricing and our SaaS pricing pages. We put so much time, sweat equity, and love into our products, but when the time comes to set up our pricing and build out our pricing page we spend only around six hours total arguing amongst our teams before just “shipping it out and seeing how it does.” Hopefully, you realize the irony in that situation (that we’ve all been in), especially when going into your next marketing analytics meeting. There is hope though, because even though pricing seems difficult and insurmountable; it’s not - pricing is just a process like everything else. 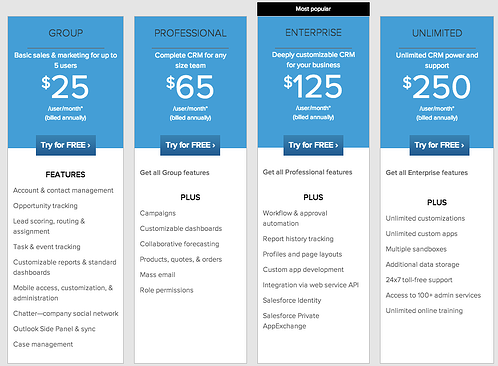 We’ve documented the Saddest SaaS Pricing Pages of 2013, but we think it’s time to really point out some great “learn by example” options that really nail the concepts of proper pricing strategy. These SaaS titans succeed through three main axes: 1. clear buyer persona alignment, 2. phenomenal use of scaling value metrics, and 3. being just darn beautiful. Whether you’re pricing something as simple as a pencil or as complicated as a cloud storage platform, all pricing roads begin with the almighty buyer persona. We’re not just talking about some pretty powerpoint slides with “concepts” of buyer personas; we’re talking about buyer personas that have been quantified and streamlined (step by step instructions to doing this in that link). Quantified buyer personas are so important, because each of your pricing plans needs to align to each of these personas in terms of packaging and the number you’re actually charging. The implication of proper alignment is that your entire marketing and acquisition funnel falls into place and you end up selling the right product, at the right price, to the right person. To illustrate this a bit more, take a look at Salesforce.com’s CRM pricing below. Notice how their feature differentiation is exceptionally distinct between their tiers. In fact, Salesforce’s pricing is so clearly defined between tiers that there are very few segments of customers who come through their funnel and have to truly choose between plans. To put it another way, think about their target customer spectrum for a second (sales teams big and small). There are very few small sales teams that require less than 5 seats (the Group plan’s limit) that would also need mass email. Similarly, a company that needs API integration is probably big enough to afford a higher price, because they’re paying for custom build outs or other software that connects to Salesforce. Granted, there are always going to be some border customers that get burned (we have a small sales team, but have API integration needs), but the benefits still outweigh the costs if you’ve aligned your personas properly. 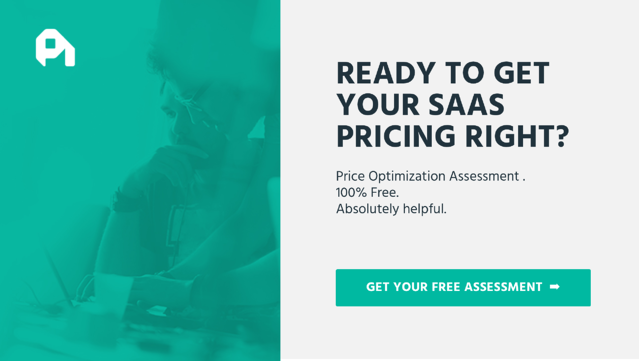 The bottom line takeaway: Your SaaS pricing begins with your buying personas. Proper alignment means your SaaS metrics fall into place. Once you’ve taken your first few steps down the yellow brick pricing road with persona alignment, the second biggest factor in successful pricing is the almighty value metric. A value metric is essentially the unit that a customer pays for - per user, per GB, etc. While personas are exceptionally important for funnel and price alignment, a value metric is paramount for proper price differentiation and expansion revenue. Their power lies in their ability to ensure that when a customer gets more out of your product - through usage, ROI, etc. - that you’re capturing a portion of that increased value. After all, you wouldn’t want to charge Disney’s 500 person sales team the same amount as Price Intelligently’s 3 person sales team, would you? Another way to think about it is to pull out our trusty demand curve below. The beauty of SaaS is that through usage throttling and feature differentiation, we don’t need to just capture the revenue represented by the solid blue box at the $25 price point. We can capture the revenue throughout the entire are under the curve with different price points and more variable pricing. Seems awesome, but also pretty straightforward, right? Well, so many companies get this wrong by either not identifying properly where customers actually derive value from their product or making their value metric(s) so convoluted that buyers can’t really understand them. Two companies that get this concept completely right are HubSpot (a marketing automation platform) and Insightly (a CRM for small businesses). We most recently did a deep dive into HubSpot’s complete pricing strategy, but we can’t speak more highly about their value metric of “number of contacts” (pictured below). 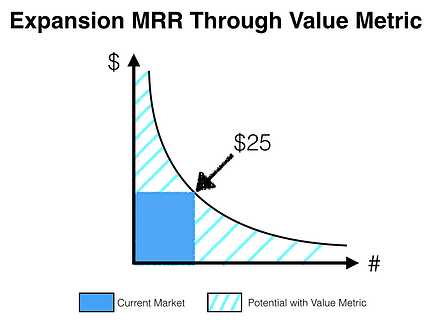 The reason their value metric is worthy of learning from is because it’s the closest metric to where customers are getting value from the product. Theoretically, the perfect value metric would be taking a portion of the revenue gained from their customer’s leads, but this fails our value metric tests in terms of being more difficult to understand and track. Insightly is worthy of note because they face a different dilemma than HubSpot. While HubSpot’s revenue can expand easily if their customers hit patches of growth and increase in number of contacts, Insightly’s core customer of small businesses means that they aren’t going to have a lot of customers with 300 sales people like a Salesforce. 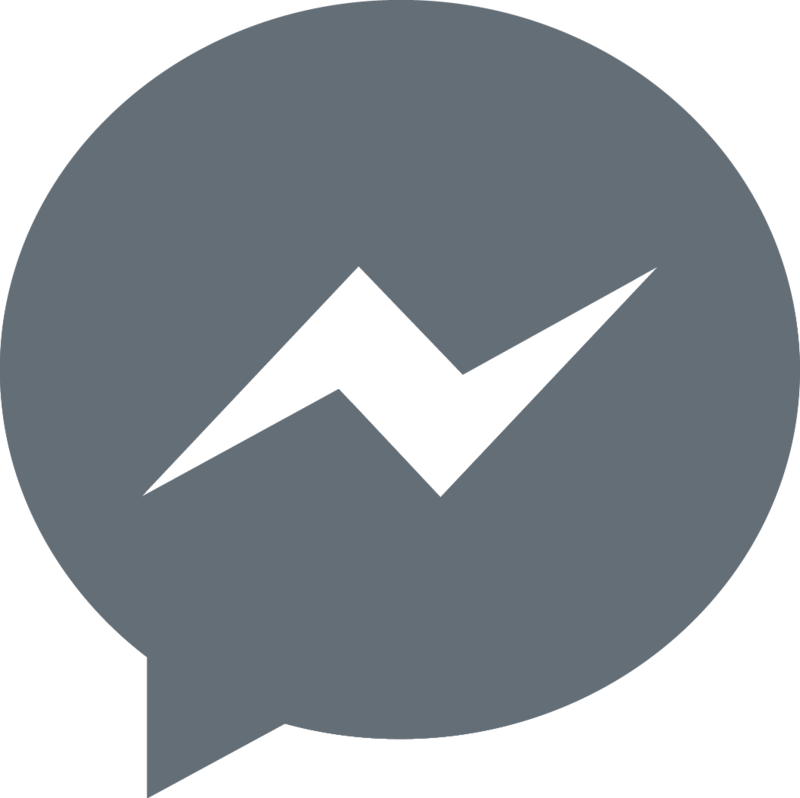 Although this may seem like a weakness, it’s actually a strength, because they can still use “per user” as their primary value metric, but can also put some limits on their free and core plans with features and number of contacts/leads. This forces power users on the free plan to make a buying decision when they’re clearly getting a lot of value out of the product. The pricing schema also keeps things incredibly simple and focused on the one type of paying user with only the very large small customer needing to move into a larger Enterprise tier. The bottom line takeaway: Make sure you have a multi-price mindset that throttles value by taking advantage of your value metric(s). For more on identifying and optimizing value metrics, check out our value metric guide. "Your #pricing needs a multi-price mindset that takes advantage of your product's value"
Getting your persona alignment and value metrics properly tuned is imperative to a good foundation, but keep in mind your SaaS pricing pages need to look good, too. We live in a fickle world where you quite literally have 30-60 seconds (probably less) to make a good impression on a visitor who clicks through on your pricing page. If they don’t understand your pricing or don’t feel like you’re credible - you’re toast. This is why design is important and goes well beyond just looking beautiful. 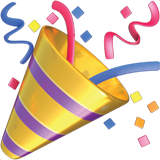 Both UserVoice and Docusign are solid examples of well designedpricing experiences. You’ll notice that neither are necessarily going to win big, fancy UI and branding awards. Yet, they’re both clear, concise, and allow the prospect to drill down into the level of detail needed or wanted. UserVoice for instance has 40+ different aspects to their product with a lot of them being differentiated between different tiers. Notice how your initial look at their pricing page only shows the main differentiators between the pans and then gives you the option to explore more with a great big “view full feature list” button. 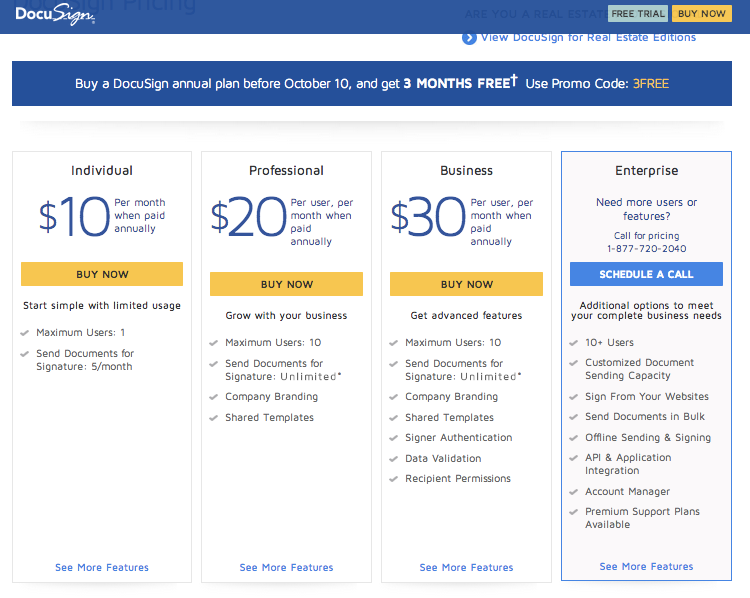 Docusign also follows a very similar strategy with a main pricing grid “above the fold” and then plenty of room for all of the “kitchen sink” features down below. Interestingly enough, Docusign was on our Saddest SaaS Pricing Pages list at the beginning of the year for being burdened by the “too many check marks” problem. Yet, it looks like they’ve had this page since April, so we’ll assume it’s been doing better than the old one. 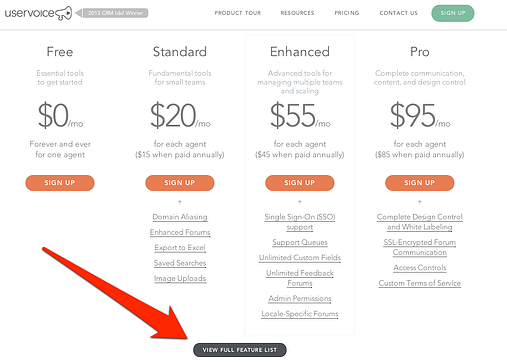 The secret here is to not treat your pricing page as an afterthought. Make sure you’re not just dumping everything into one giant list, because more often than not your buyer personas (that you defined much more above, right?) don’t care about 80% of your features when they’re making a buying decision. They probably care about the core functionality and maybe 1-3 specific features to them. The bottom line takeaway: Treat your pricing page as one of your most important touch points, designing the flow of information to properly market to your buyer personas and prime them to purchase ASAP. "Don't forget the design and experience of your pricing page. It's the gateway to your revenue." For those of you who read a lot of our posts, you’ll know that all of the companies listed above are actually still making some mistakes, too. Yet, judging by their success and history, you’ll notice that all of their pricing has evolved significantly since they began, ebbing and flowing with new feature releases and the changing landscape of their buyer personas. Pricing is a process. Treat it like one, especially when building in a sector that is as nimble as SaaS. You’ll inevitably continue to chip away at your pricing opportunity, and ensure you keep your bottom line growing and profitable.